In reviewing this film, Fikri Jermadi admires the bravery and searing honesty of Namron. The story tells of Bakar (Auf Razak), a young man stuck in very difficult personal and professional circumstances. Having made his way to the city from the countryside, he discovers how difficult it is to maintain any sort of livable lifestyle that can help to sustain his family back home too. 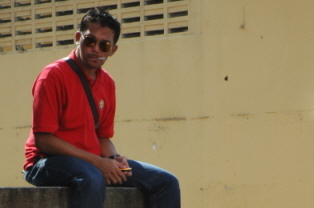 The absence of an on-screen father (the mother was portrayed by Mislina Mustaffa, almost in a cameo fashion) suggests that he lacks a strong form of guidance, and has had to make his way around with some chips on his shoulders. Having said that, some of these issues are brought about by his lack of aptitude and professionalism. He soon realises, however, that he is in the last chance saloon, and sought to make his way to attend an interview at a company. Along the way, he meets with a variety of characters, good and bad, but all who would end up playing an important role in Bakar’s journey. To begin with, the film feels like a reunion of some of the key cast and crew members of ‘Psiko: Pencuri Hati’, which was also directed by Namron. Sharifah Amani, Bront Palarae and Ayam Fared play important roles both in front and behind the camera respectively, but given that that film was made later, perhaps this should be seen as the true starting point for that particular production. 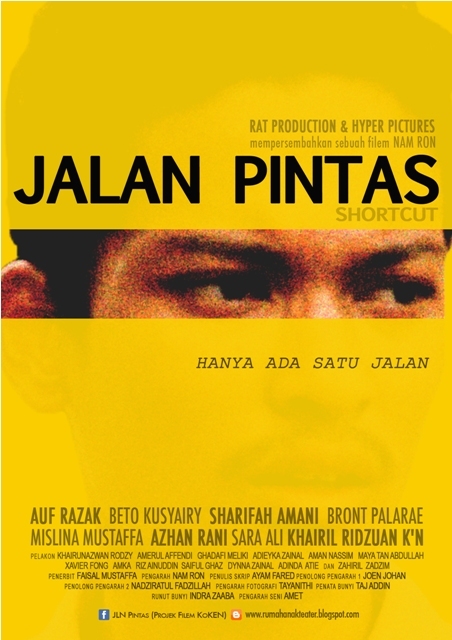 Coming back to ‘Jalan Pintas’ (which means shortcut in English), as a whole there’s not much I myself would change about the story or character of Bakar. Of course, the character can be quite pathetic and immature at times, to be perfectly honest with you, but that’s the impact I suspect the filmmakers were looking for. The film looks to create situations that would truly test Bakar in a number of different situations, piling on the pressure as the story progresses. I’m not entirely sure whether I myself would have reacted the same way, but then again, I am not in the same situation, and so a better judge for that could be found. However, the escalation of conflict in the film works in a very systematic way, with measured inserts from Bakar’s past aiding to provide a better understanding of how this whole situation came about. In that regard, it is admirable in portraying Bakar’s strength and resilience. That is (a part of) the intent, I am sure, of the director. The political subtexts, however, cannot be ignored, especially since the filmmakers have a background in producing texts laden with them. Namron, for example, produced and directed the likes of ‘Gedebe’ and ‘Gadoh’, while the aforementioned ‘Psiko Pencuri Hati’ (a more mainstream effort), still hits home with those who are keen enough to seek out such interpretations. Here, it seems as if Namron has been let off the leash, for there is a noticeable amplification of both intent and anger. We see this in a scene where Bakar attempts to purchase a cigarette from a trader. It’s a small establishment, perhaps somewhat semi-legal in nature, the kind where you get what you want and get out. Here, however, Bakar wanted to save some of the very little money he had left, and attempted to purchase a cigarette without buying the whole box. It’s successful in the sense that it hammers home the financial situation he was in at the time, but though the seller was initially very reluctant to do so (it’s illegal to sell single cigarettes from the box), his attempt to squeeze more metaphorical bang for his literal buck resulted in a more literal bang of a fight between the seller and him. It is now that all of Bakar’s frustrations come to the fore, and he launched a tirade against the seller (who admitted she wasn’t a Malaysian) and those of foreign origins who come over here to take over our jobs. For a minute I thought he was impersonating a Brit pissed off about Romanians, but he’s merely a conduit, representing a common argument bandied about in the nation’s media. Ferrari fans: gangsters, the lot of them. Is it possible, then, that this film can be enjoyed without truly understanding the contexts of its production? We can say that for practically every film ever made, for it is the context that helps to shape the text and its production, but here, I suspect that it would be a big miss for those who does not truly throw themselves into the battlefield that is Malaysian politics. “But you have subtitles, right?” I hear you say. Yes, much like many Malaysian films released both in cinemas and on home video these days, the much-vaunted lower-third connection of words helps us to understand a bit more of the story, but still does little for the context itself. I say ‘a bit more’, because…well, quite frankly, it is absolutely atrocious in some parts. The actual translation is not as accurate in many segments, which is probably fine, because…hey, nobody’s perfect, right? But to translate the character’s name as well is simply unforgivable. The name of the protagonist was translated in some parts as Burn bin Najib (a child of the current political father of the country, perhaps, suggesting the failure of certain policies? ), the actual literal meaning of the word bakar. It is absolutely ridiculous, and I can’t believe that managed to slip through. There are many other, similarly ridiculous examples I won’t name here, but just to be sure: this is not me in grammar Nazi mode or anything. This is me being incredibly pissed off at a small movie with big potential and story being let down by ‘filmmaking a la kadar’. That’s the term I use to describe those who make films without truly paying proper attention to the significant intricacies that differentiates the professionals from the amateurs. In this respect, it is pathetic. Where there is Amerul, there is Zahiril. Seriously. I could go on and on about the subtitles, but I shan’t, because this film deserves a lot more. From other aspects of production, the film reflects the low-budget nature of its production, but this is no real drawback, for it helps in portraying some aspects of the story in a grittier fashion. That’s the whole point of the film, to portray a version of a truth that we are rarely allowed to articulate in a more critical and, dare I say it, intelligent fashion. I would say, though, that I am not entirely a big fan of how the time of the film has been managed. By that, I mean the film’s way of handling how the story is told. Some parts were ‘rewound’ to an earlier part, thus allowing Bakar another chance at deciding which path to take: the short cut or the long way around. This was exemplified in the first scene, when Bakar was mugged and stabbed. The film then rewound and starts again at the part before he was stabbed. By the way, this is not a spoiler, since it is something that happened in the first scene. Of course, he would then take an alternate decision. Similar techniques were used in films such as ‘Run Lola Run’, where the director happily admitted the adaptation of video game storytelling methods (when your death does not mean the end of the story). Here, the plot points during which that technique was used makes me feel, in a way, cheated. Not unlike ‘Run Lola Run’, I simply do not know how much of my emotions I should invest in the characters trials and tribulations. One such scene near the film’s end was replayed in an almost identical manner, and was a bit longer than many of the same ‘bits’ in the film. I wondered for a moment whether it was a mistake. In a scene, there was a car accident scene between two characters played by Faisal Mustaffa, the film’s producer, and its writer, Ayam Fared. A clash between the practical and the creative, perhaps? Tweaking some of the points made above here and there may help to improve the film as a whole, but many of the above is more of a personal preference (obviously), and they should not deter you from watching this film. It is a good story developed properly, one that reflects on an issue that deserves to be aired in more artistic and critical manners. Fikri thinks that Auf Razak looks a lot like the film editor, Azharr Rudin.